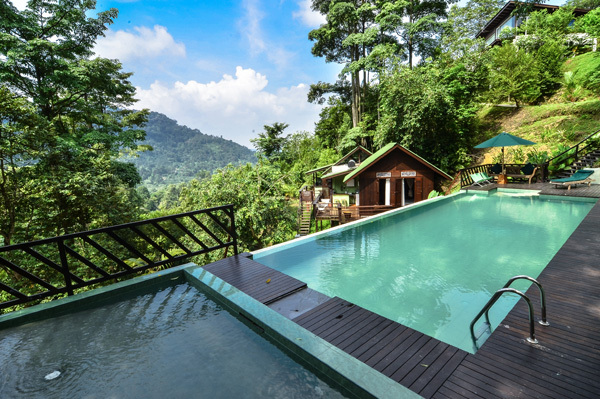 The Dusun is a small eco-resort on a durian orchard. 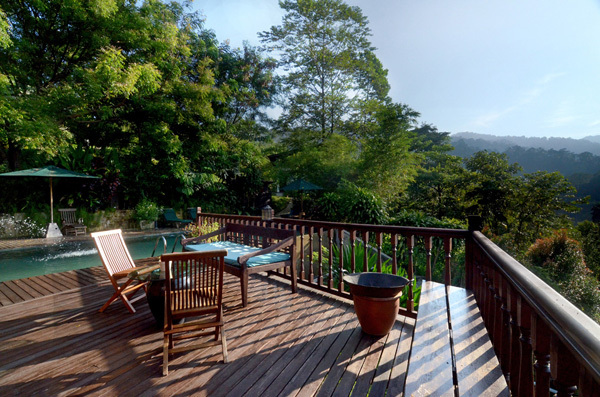 With five fully equipped bungalows, guests can enjoy privacy, the calm songs of birds, and lovely views of the distant Mantin hills and Berembun Forest Reserve. 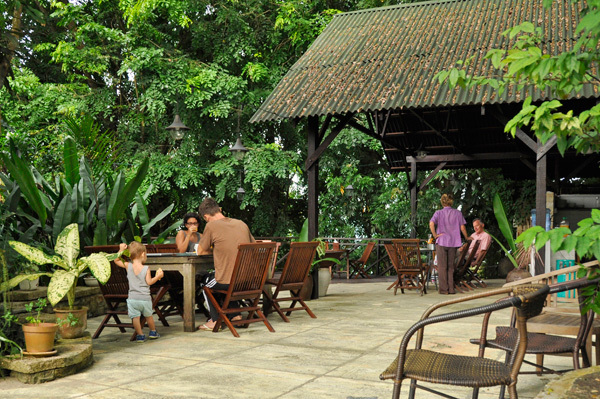 It is the perfect place to spend quiet quality time with loved ones or by yourself. 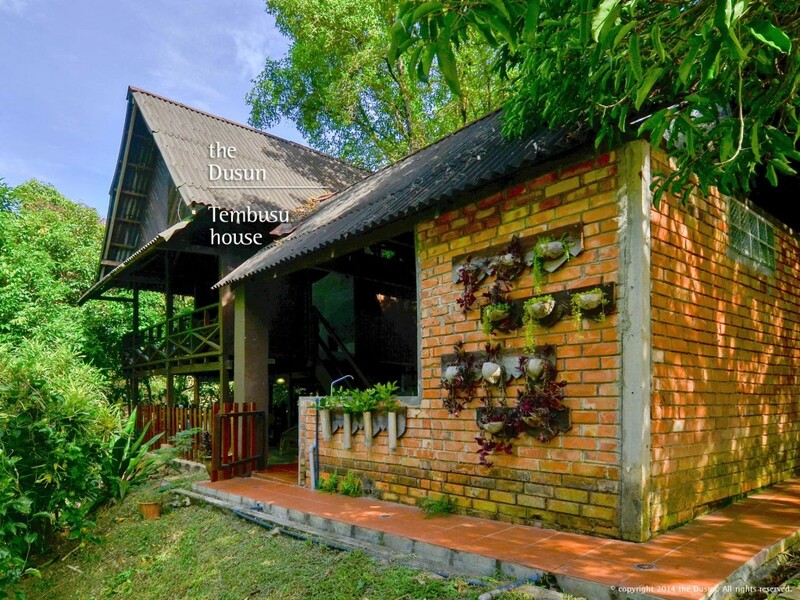 With guest houses on the top of a little hill, you can enjoy cooler temperatures at night. 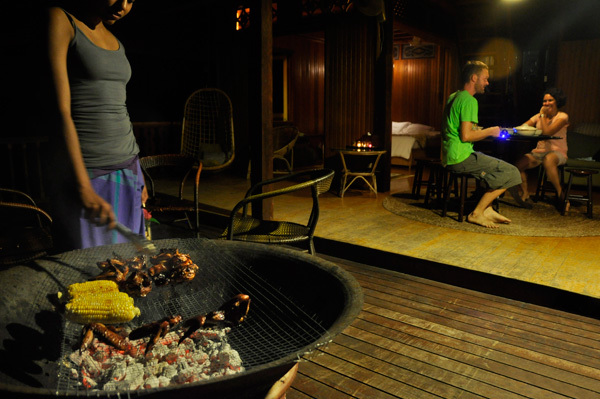 Each house has fully equipped kitchens and outdoor barbecues which there are light for guests in the evenings. Minangkabau food traditional to Negeri Sembilan is also available. 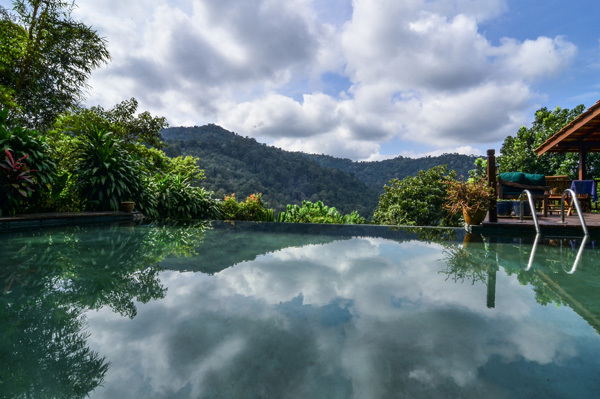 Just 10 meters from the lower pool, with attached baby pool, is Perling House, a double unit with 2 self-contained apartments joined by the outdoor deck. A traditional Malay design with modern touches, the house is named after a bird (the Asian Glossy Starling) that comes in flocks to eat the berries of our palm trees. The houses look out on the jungle and the roar of the river can be heard from them. They can be rented together or separately. In front of Tembusu House. Emas, or golden in Malay, is a traditional Malay house which uses recycled hardwood extensively and incorporates many unique pieces from Helen’s scouring of junk yards. The house is shaded by trees most of the day and its carved panels and shutter windows are designed for coolness. The wood has a golden hue that is lit by the setting sun. 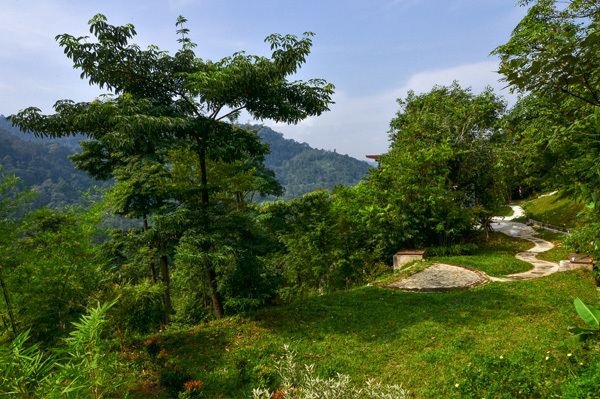 Emas House has a serene view over miles of rolling hills towards the Straits of Malacca. The house is set at the end of a gently sloping path of steps and is very private. For more about rooms, please refer to their website here. Check-in : 3.00 p.m. / Check-out : 12.00 p.m. The road up to The Dusun is very narrow, so for safety reason they cannot have drop in guest. Please make a reservation first before you come. The Dusun gives priority to couples and families. Not noisy parties and no day guests allowed. You may not bring more then the numbers booked. Maximum numbers are for everyone’s comfort and non-negotiable. Children are those aged 12 years or below. 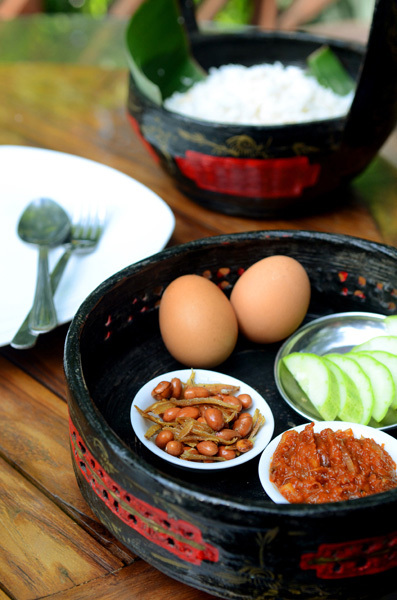 The Dusun are closed on most Sundays except for long-stay guests and closed on December 24, 25 and 26. Rates are nett, per house and include breakfast. All transactions are in Ringgit Malaysia. Weekend bookings : If you would like to book 2 nights or more, you may do so anytime. If you would like to book 1 night, you may only do so 3 weeks or less before the stay date. 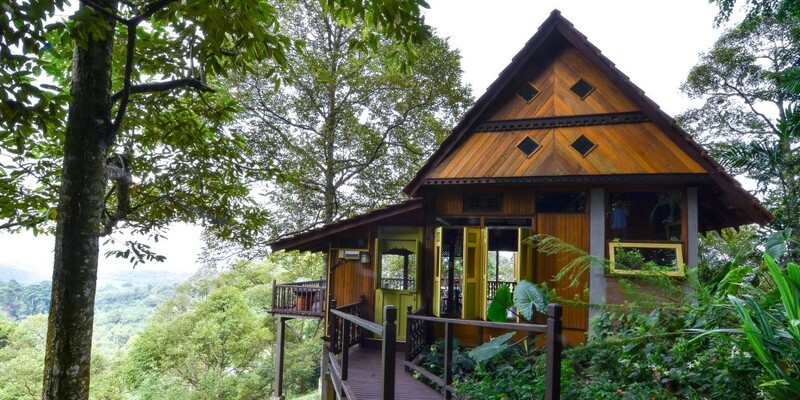 Couple Rates : If Sora or Emas are available, couples can book the houses for RM 600 on weekdays and RM 700 on weekends. Couples can book this 3 days before the booking date. Please mention “couple rate” in your booking enquiry. This rate only applies for two people. Cancellation : Before 14 days of the booked date can be changed to another date at no cost. Cancellations 14 days or less before the booked date will be charge 50% of one night stay. Cancellations within 48 hours of booked date will be charged one night stay. Cancellations within 24 hours of booked date will be charged the entire booking and considered a no show. To make a reservation, please go to their website here. Garden area for events, games and gathering. Have private BBQ at your house. 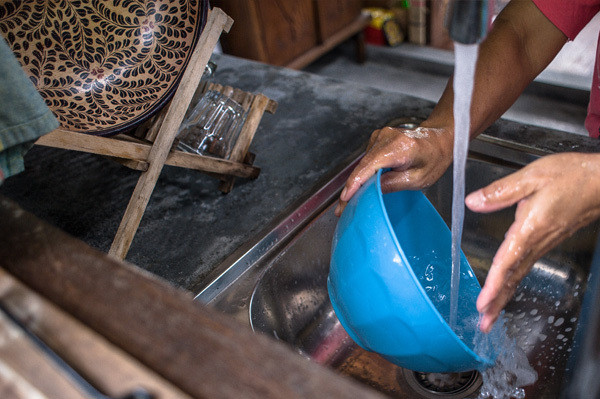 Housekeeping service includes washing your dishes. Lower Pool, the baby wading pool and the beautiful Berembun forest. 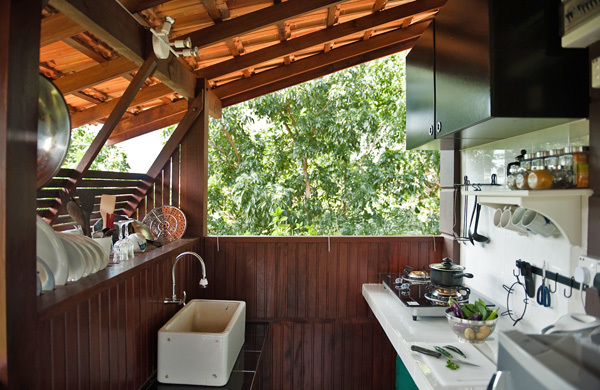 Kitchens are available in all house. Dining patio for breakfast and catering services. 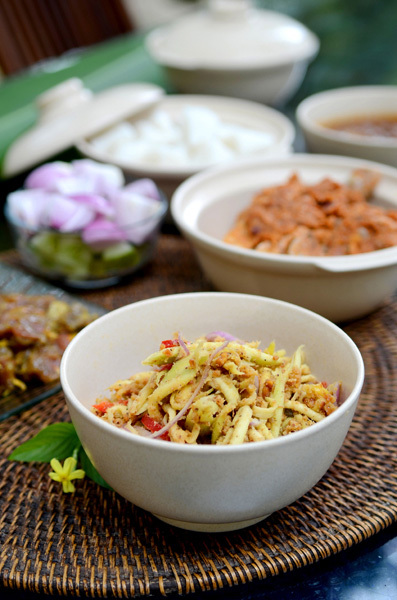 Minangkabau cuisine is one of the menu for catering service. Photo credit to The Dusun. The road up to The Dusun is very narrow, so please make a reservation first before you go. From KL by E21 LEKAS expressway, take EXIT 2106 Ampangan. Turn left onto Route 86 heading for Pantai/Jelebu. Follow the road for 5.4 km until you reach at the town of Pantai. Turn right onto the road to Kg. Baru Pantai. From KL Sentral Station, take KTM KOMUTER to Seremban Station. It will take about 1 hour and 20 minutes. Then, take a taxi to the resort. The journey will take about 22 minutes for the 16 km journey.